Before You Go Shopping, Make a Budget, Make a List, And Stick to It! There is an old saying that if you fail to plan, you plan to fail. That is certainly true when sticking to a grocery budget. If you know how much you can spend when you go grocery shopping, you can make better choices when planning your meals. Financial advisor Dave Ramsey tells us that around 10% of your total income is a great place to start a grocery budget. Of course, this means making a budget for every other financial aspect of your life as well. 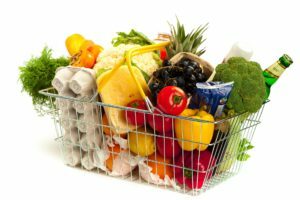 If 10% is not enough to sufficiently and nutritiously feed your family, spend a little more here, and cut back in some other area. Stick to this budget for at least 30 days, then review and make necessary changes. Let’s look a 7 maybe not-so-common ways to stretch your grocery dollars. When you purchase foods that are in season and from local merchants, you generally get fruits and vegetables that have fewer preservatives, insecticides and other chemical negatives. Also, buying in season means that you usually spend less for food items. When local farmers harvest their produce, they get it to local stores and farmers’ markets as quickly as possible. They have an abundance of fruits and vegetables at this time, and that tends to drive down prices. By purchasing locally and buying in season, you get the most nutrients and nutritional benefits that food has to offer. When you buy in season, you save money while eating the healthiest fruits and vegetables. Then there is the knowledge that by supporting local merchants you benefit your local economy, as well. You probably end up throwing away food and never give it a thought. But keeping track of what gets tossed is a good way to better utilize your grocery budget. Keep track each month of the different types of foods and beverages you are throwing out. Look for patterns and areas that need attention. No one wants to waste food; this is a good way to determine where you can make smarter decisions about meal planning and food purchases. And this brings us to our next budget-healthy tip. While it may seem counter-intuitive, buying in bulk can save money. At wholesale clubs like Costco and Sam’s Club in the United States, membership is free to certain businesses, trade organizations, and other corporations. The annual membership for individuals is affordable and the savings realized is immediate when you shop for the first time. The savings come when you buy bulk items that you would ordinarily purchase at your local supermarket. For example, canned goods such as tuna and an assortment of condiments and spices will go a long way to stretching your grocery dollars. These big-box stores are an excellent source for bulk baby items, clothing, and toiletries as well. And don’t forget your local Walmart. The fact is both are healthy and inexpensive. From soups to sandwiches, salads to casseroles, the inexpensive chicken is extremely versatile. Usually costing much less per pound than beef, lamb, and pork, chicken is the basis for many healthy meals. If you can buy eggs locally, then give it a try. See if you can find farmers offering eggs from pasture hens; these are the healthiest eggs you can buy. When you go straight to your local farmer and cut out the middleman, these ultra-healthy eggs wind up costing you less than pastured eggs at your nearby specialty health food store. If you don’t know what farmers are located near you, check out LocalHarvest.org. While fresh is always best, frozen foods are often times healthier than their canned counterparts. Just make sure you read nutrition labels. You will find that purchasing frozen foods allows for a lot of versatility. You also end up throwing out less food, since you simply portion off the amount you need each and every time you cook. While market prices fluctuate, fresh grapes, apples, and bananas can still be inexpensive per serving. Fresh garlic is routinely inexpensive while delivering many health benefits. It improves memory while also improving your heart health with amazing antioxidants. It also reduces your risk of cancer and Alzheimer’s. Go garlic! Raw, fresh kale is very versatile and has to be considered the antioxidant King of fruits and vegetables. Broccoli, winter squash, sweet potatoes, watermelon, pears, and Kiwi are also inexpensive but healthy single-ingredient food items. Eating clean, healthy food, while sticking to a budget, can become a challenge. For one thing, it means avoiding pesticides and other possibly dangerous chemicals that can make their way into your food. To help out consumers, each year the Environmental Working Group publishes its annual “Dirty Dozen” and “Clean 15” lists. The 2018 guide took 12 common and popular vegetables and fruits and ranked them according to the “dirtiest” and “cleanest” of the bunch. The EWG guide is based on the report published by the U.S. Department of Agriculture together with the Environmental Protection Agency. The “Dirty Dozen” identifies common fruits and vegetables with the most pesticide residue present; the fruits and vegetables you want to wash thoroughly before eating or avoid altogether. The “Clean 15” highlights which fruits and vegetables proved to be the cleanest, showing a presence of the fewest possible pesticides. While the “Dirty Dozen” group poses no health risk, it is information that is available to you. Then you can make the choice of buying organic or not. You can check the official Environmental Working Group website each year for an updated list. Now you have some tips on how to shop on a budget. Sit down and write out a sensible grocery budget, plan your shopping, buy in bulk. Soon you will quickly spot bargain grocery and produce shopping opportunities that are also healthy and delicious. When you consciously practice these 7 budget healthy tips on a consistent basis you will develop healthy habits over time. Continue to focus on at least a few of these strategies each and every time you shop and prepare meals and watch your waistline shrink without shrinking your bank balance.